Leveraging our 30 years of call center experience and the management team to support it, OnBrand24 provides some of the largest hospitals and healthcare organizations around the U.S. with 24/7/365 coverage. Our advanced representatives are HIPAA certified and prepared to deal with confidential information. 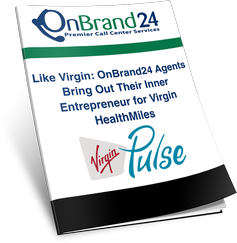 Whether it is appointment setting, class registration or post-patient discharge follow up, OnBrand24 has the agent skill set needed to meet the diverse needs of your customers and patients. Talk to one of our sales professionals to design a custom solution for your healthcare organization's needs. Our current partners leverage our software and operational expertise to move critical elements around the country, front-end calls for rehabilitation services, register for community health events, and many other needs.